Galls or stem swellings on citrus trees need to be removed by pruning by the end of August, as very tiny black wasps emerge from the galls in September and October ready to lay a new batch of eggs in citrus stems. Because these wasps are poor fliers, they tend to reproduce on the same tree unless blown by wind to a new host. 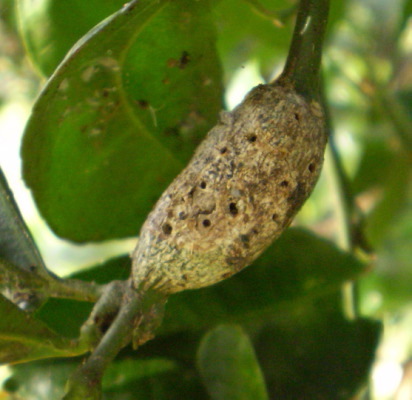 Unlike many other wasps that assist pollination or are pest predators, the citrus gall wasp is a true pest. 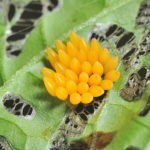 Eggs are laid in young stems of citrus trees, particularly lemon and grapefruit varieties, and the native finger lime. 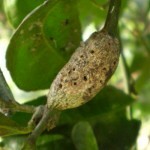 The larvae remain within the stem, stimulating the growth of cells, and causing a gall or swelling to form on the infested stem by early summer. Trees that are repeatedly attacked will become weaker and produce less fruit. Originally, only coastal gardens of New South Wales and Queensland were affected, however, this wasp is spreading to other areas of Australia. Do not add galls to the compost heap. Burn them, or dispose of them in a sealed plastic bag. It is very likely that the gall in the photo missed last year’s pruning because it is unusual for galls to reach that size in one season. As you can see, the tree in the photo is also affected by scale, and it is more common for citrus gall wasp to attack stressed trees. After pruning, water the tree thoroughly, and feed it with a complete organic fertiliser and as much compost as you can spare. A drink of seaweed extract tea will help it to resist further pest and disease attack. 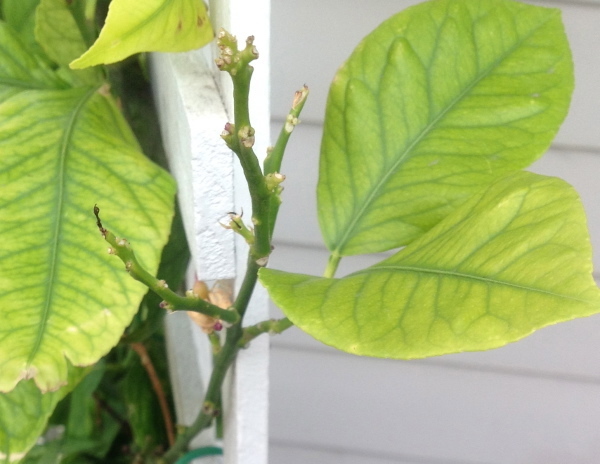 It is not too late in most areas to correct pale citrus leaves. These are usually caused by either magnesium or iron deficiency. 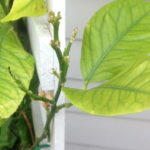 See: Yellow or pale citrus leaves. Finally, cold weather is setting in, which means it is time to start making marmalade, lemon curd or preserved lemons as citrus fruit ripens. It is also time to set up a support frame and sow broad beans and peas in temperate and cooler areas. ‘Coles Dwarf’ and ‘Egyptian’ are better varieties of broad beans for milder or windy conditions. Broad beans and peas love a humus-rich soil that is well-drained but avoid adding manures. 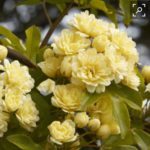 The following gardening advice is an abbreviated list for vegetables, fruit trees and some culinary herbs that can be sown or planted during June in Australia and New Zealand. A comprehensive monthly guide that includes planting times for the entire garden, as well as when to fertilise, prune, weed, take cuttings or divide plants, can be found in the diary section of my book Easy Organic Gardening and Moon Planting (Scribe Publications, 2006, 2009, 2012, 2017), and e-book (Booktopia 2012, 2017). 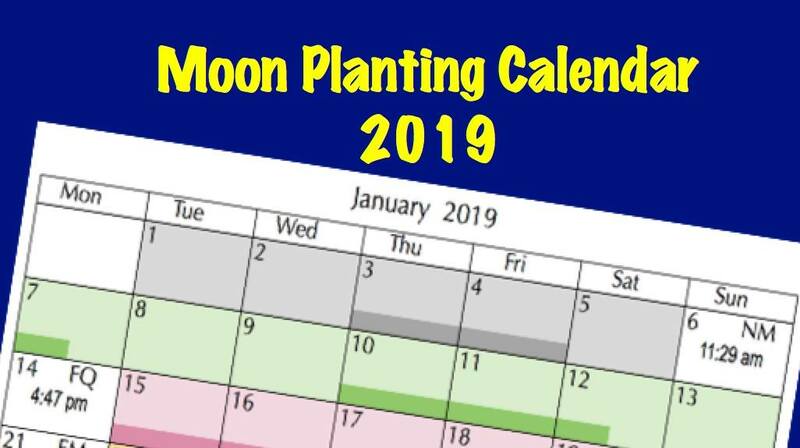 * For gardeners who do not use moon planting: sow or plant out any of the following list at any time this month, although you may find germination rates are lower when the Moon is in Last Quarter phase. 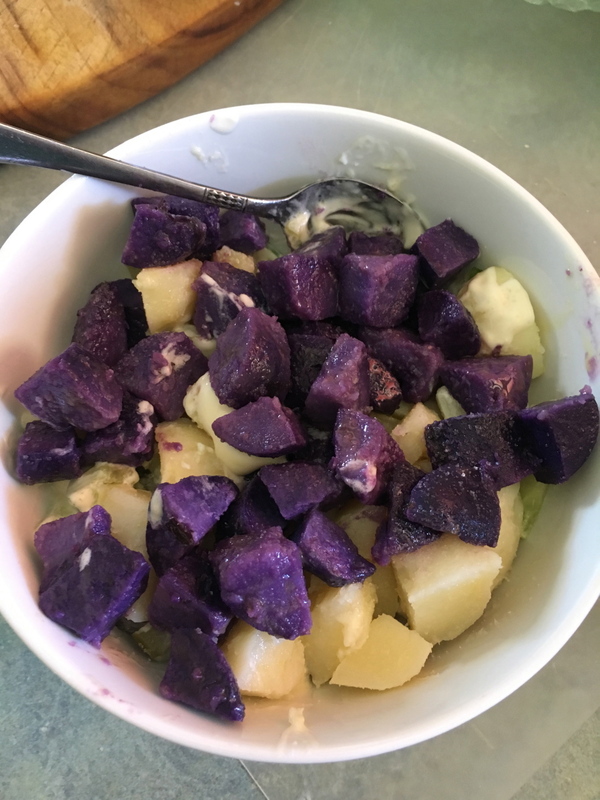 Before the Full Moon, cabbage, and grains can be sown directly into beds, as well as a green manure crop of barley, chickpea, red clover, broad bean (faba bean), field pea, or triticale. 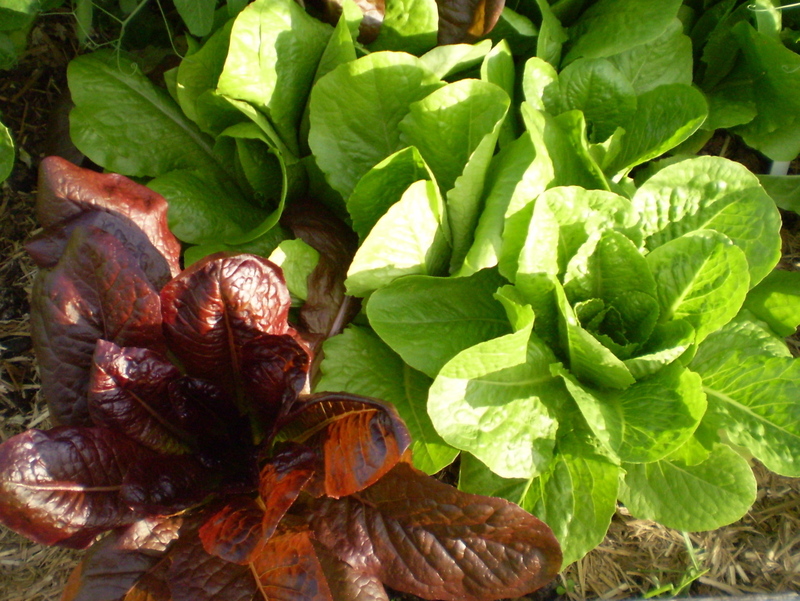 Lettuce, radicchio, English spinach and spring onions can be sown or planted out. 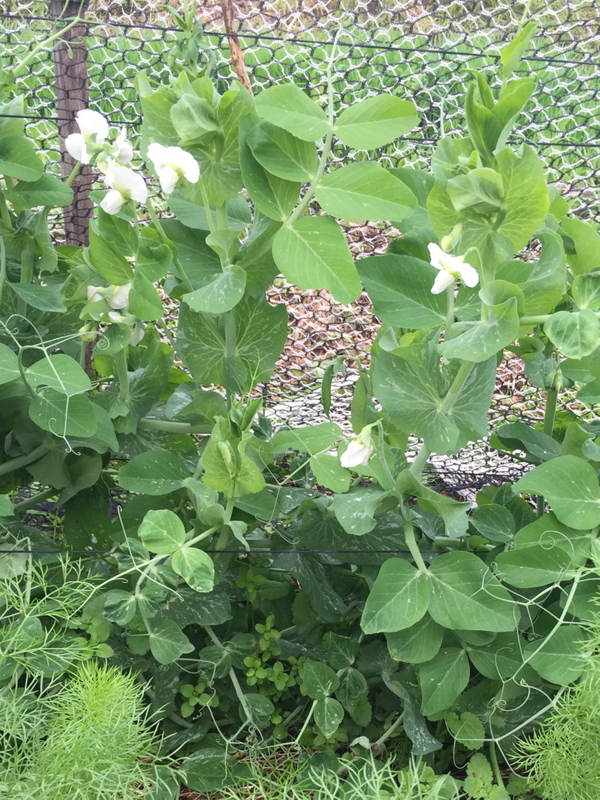 During First Quarter phase, dwarf peas can be sown directly into beds. During Full Moon phase, radish and turnip can be sown directly into beds, as well as potatoes north of Brisbane. Asparagus and rhubarb crowns, fig, kiwi fruit, pecan and pistachio can be planted. Before the Full Moon, cabbage, open Chinese cabbage, grains, lettuce, mizuna, rocket, silver beet, tatsoi, chamomile and coriander can be sown directly into beds, as well as a green manure crop of barley, corn, lablab, or triticale. During First Quarter phase, bush and climbing beans, popcorn and sweet corn can be sown directly into beds, and pumpkin, spring onion, summer squash, tomato, watermelon and zucchini can be sown or planted out. During Full Moon phase, beetroot, radish, turnip can be sown directly into beds, and fig and pistachio can be planted. Before the Full Moon, English spinach can be sown directly into beds, as well as a green manure crop of broad bean (faba bean) or field pea. 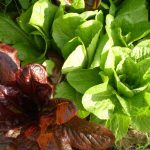 In frost-free areas, lettuce and spring onions can also be sown or planted out. During First Quarter phase, broad beans and peas can be sown directly into beds. 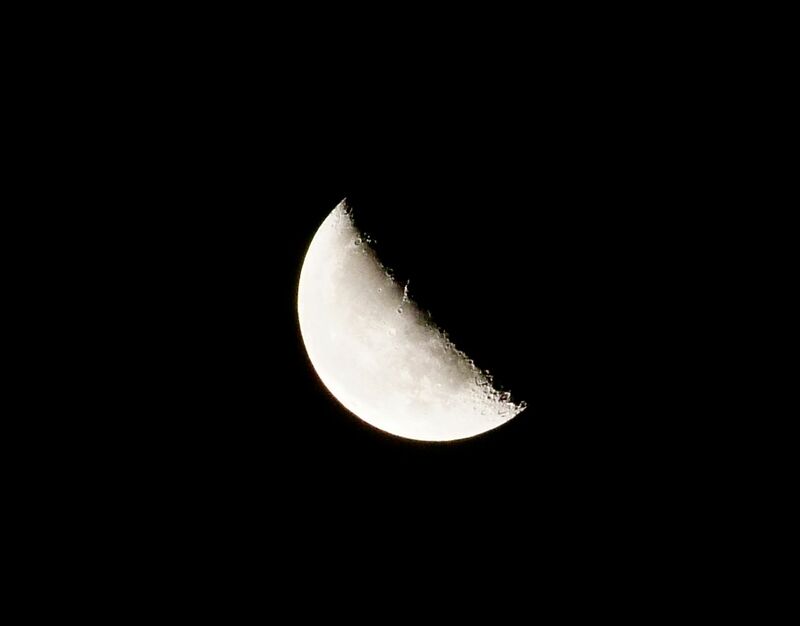 During Full Moon phase, garlic and radish can be sown directly into beds, and mid season onion seedlings, asparagus and rhubarb crowns, kiwifruit and pistachio can be planted. 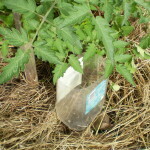 In frost-free areas, fig can be planted. Planting is extremely limited in cool climates during both June and July. Before the Full Moon, English spinach can be sown directly into beds, as well as a green manure crop of broad bean (faba bean) or field pea. 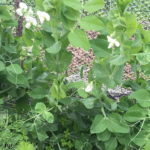 Broad beans and peas grown as a vegetable can be sown during First Quarter phase. During Full Moon phase, mid and late season onions can be sown, and asparagus and rhubarb crowns can be planted, also deciduous fruit trees and vines where frosts are not severe. 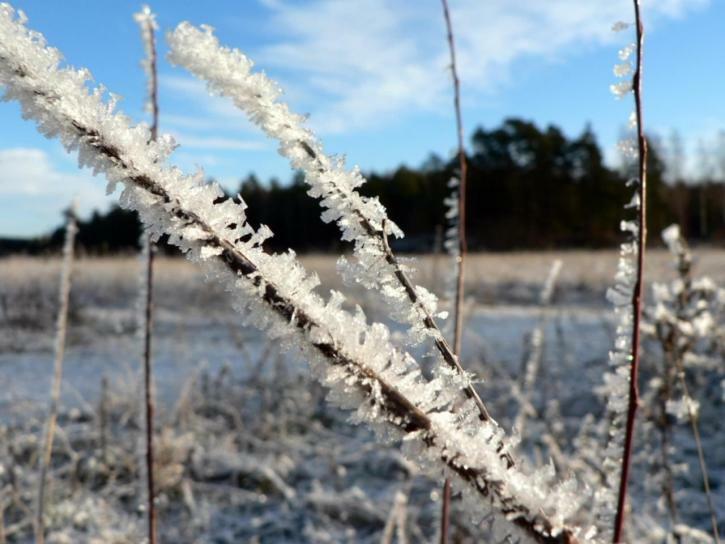 In very cold areas, leave planting of deciduous trees and vines until late winter. Just a brief post to let moon planters know that from today, 17th March 2018, the current moon phase can be found by clicking on that link in the menu bar on the Aussie Organic Gardening blog. 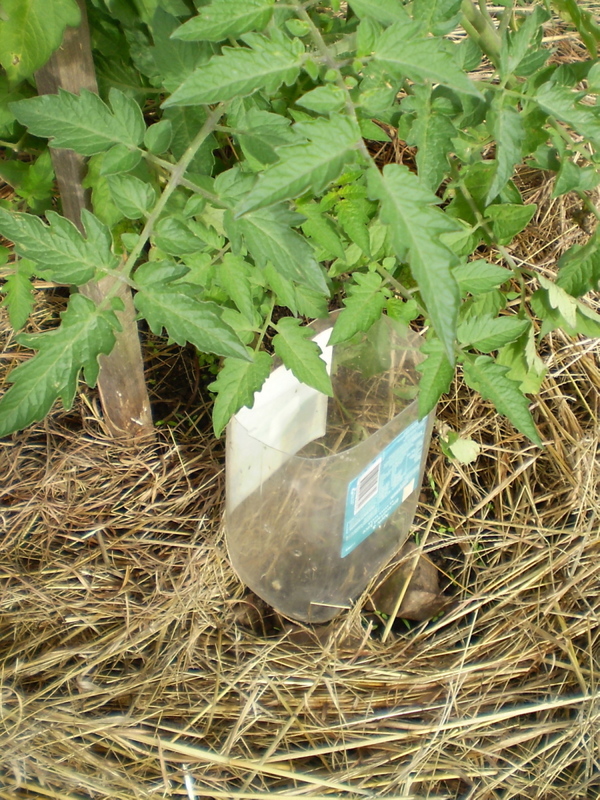 For those not familiar with moon planting, see: All about traditional moon planting. 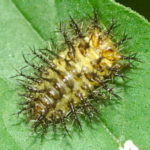 This ugly little creature is the larva of the leaf-eating ladybird. Stressed plants in prolonged hot, dry conditions attract these pests. 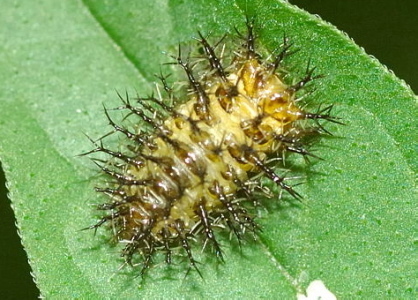 The larvae become almost black as they reach pupa stage. 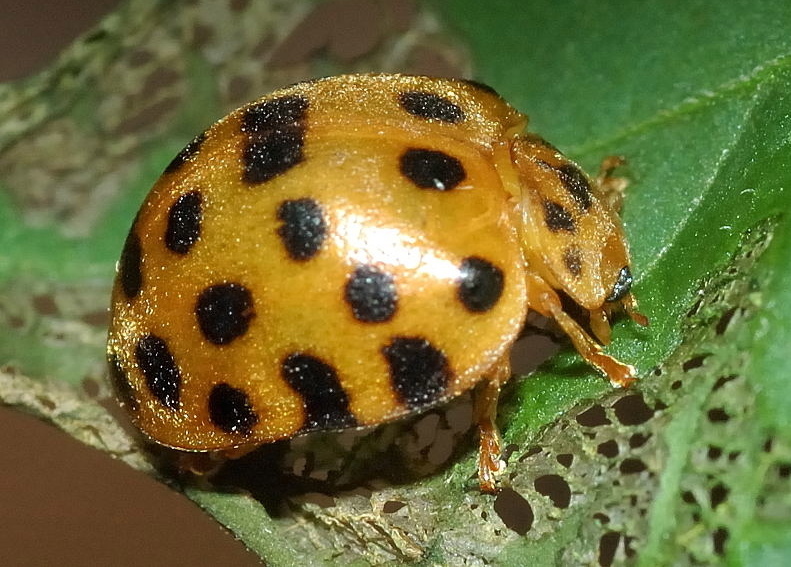 Both adults and larvae of leaf-eating ladybirds are particularly fond of the Solanum family (tomato, potato, eggplant) and the melon or squash family where they do a lot of damage to leaves. 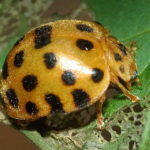 The adult leaf-eating ladybird has 26 or 28 spots in rows across its wing covers. They are slow moving and drop to the ground when disturbed. 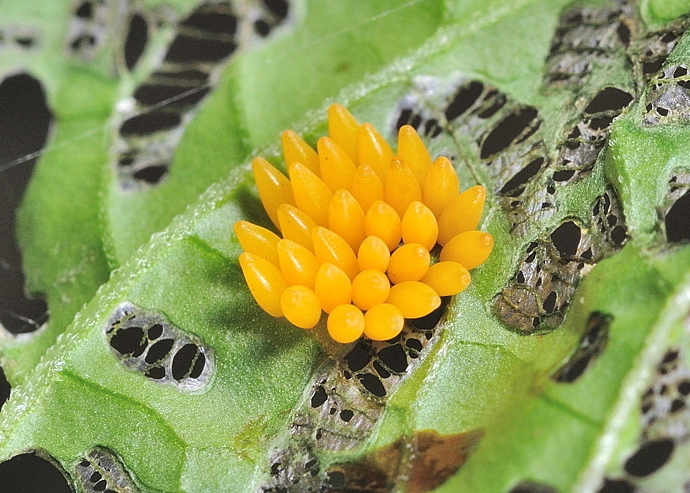 In summer, if you see the adults on leaves in your garden, be sure to look under the leaves for their eggs. Remove small leaves containing eggs and, on large leaves, use a knife to scrape the eggs into a container. As I dislike spraying my garden, I just squash the adults and larva with a gloved hand. Unfortunately, the damage done by these ladybirds and their offspring have resulted in many gardeners spraying other species of ladybirds that are voracious pest predators. Both adults and larvae consume a considerable quantity of pests such as aphids, scale and mites, and one type of ladybird feeds on fungus. Peter Chew and his family have an excellent website, Brisbane Insects and Spiders, where gardeners can easily identify which creatures are beneficial to their gardens and which are pests, and includes a Ladybird Field Guide. 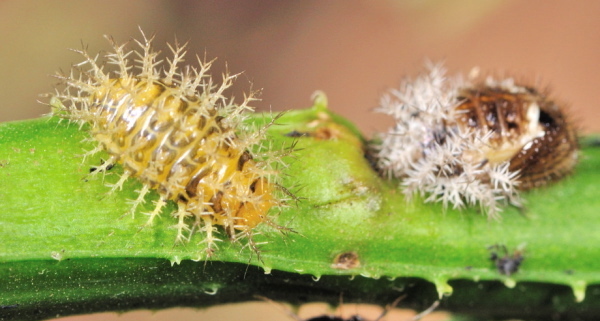 The photo below shows both larva and pupa stages of the 28-spotted ladybird.